Yesterday morning, I had a flight from Detroit to Boston, and then from Boston to Philadelphia. The weather was bad yesterday, and my nerves were pretty shot on the planes with all the turbulence! It was so nice to finally arrive at the Philly airport. I met up with Dani, Matt, and Charlene (my roommate for the weekend), and a driver took us to our hotel in Bethlehem. As soon as we got to the hotel, the other bloggers were waiting on us, so we all hopped in a shuttle bus to take us to the Runner's World Headquarters. I was SO excited to see the offices where they make the magazine! Right when we got there, we had dinner, and then Bart Yasso took us on a tour of the building. My favorite room was actually Bart Yasso's office--he had a ton of memorabilia in there! Another spot that I thought was pretty cool was a wall that was lined with the entire December issue of the magazine. I immediately looked to see if I could sneak a peak at who won the RW cover contest, but they had page holders there instead of the story. After we toured the office, we went outside to make s'mores! How fun, right? The only ones that I knew from the Heartbreak Hill Half were Dani, Presley, Charlene, Matt, and Sarah. Most everyone ended up hanging out at the hotel bar for a few hours, getting to know each other, which was fun. I really enjoyed talking to Beth from Shut Up And Run--she is genuinely a very sweet person. I went to bed late, and got up super early at 5:30. We all met in the lobby of the hotel at 7:00 to start the day. First, we were doing a surprise activity, which ended up being an "amazing race" sort of clue hunt. It was all done on foot, and ended up being a 3-4 mile run altogether. The scenery was breathtaking! I love seeing all the old buildings. We ended at the venue for the race expo, which was going to start at 3:00. 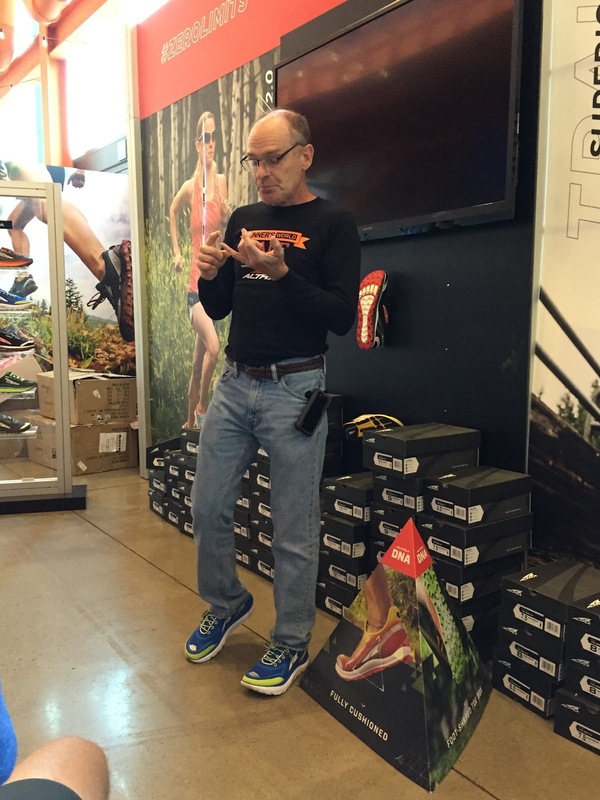 When we got there, we had breakfast and sat down to listen to a presentation by Altra about their running shoes. I wore the shoes they sent me and liked them, but after listening to the presentation today, I think I really want to try to make the switch over to using them exclusively. I really liked the story of how the brand came to be. After the presentation, Golden (from Altra) took us outside to give us a quick lesson on proper running form. It was really interesting as well, and I'll save that for another post. We also listened to a presentation by Budd Coates of Runner's World. I found his presentation fascinating--it was all about breathing while running. Sounds boring, I know, but it's a topic that I never even thought to research. He explained how we can use synchronized breathing (inhaling/exhaling in rhythm with steps) to reduce injury and train our best. Runner's World gave us his book, Running On Air, and I'm excited to read it and apply it. Budd is super fast--a 2:13 marathoner--and a four-time qualifier for the U.S. Olympic Marathon Trials. We saw a presentation by iFit, and it basically made me want to buy a fancy new treadmill ;) I'm not going to, because mine works just fine, but it's so cool to see the new technology on treadmills (they can mimic any course you create from Google maps, and automatically adjust the incline settings for it). After those presentations, we went across the street to do yoga for an hour. I've never done yoga in my life (I tried to once or twice, but I didn't even last five minutes). iFit was so generous and gave each of us a yoga bag with a foam roller, foam block (I had no clue what that was for until the class today), a mat, gloves, and a resistance band. I wish I could say that I love yoga, but alas, I still do not. My favorite pose was the "corpse pose" at the end, where you basically just lie flat on the floor and relax ;) I'm going to try it again at home, though! We had lunch after the yoga session, and it was all food made from the Runner's World Cookbook. I had a mushroom taco, which was AMAZING. I can't wait to make them at home! The white chili was also really good, as was the cornbread. 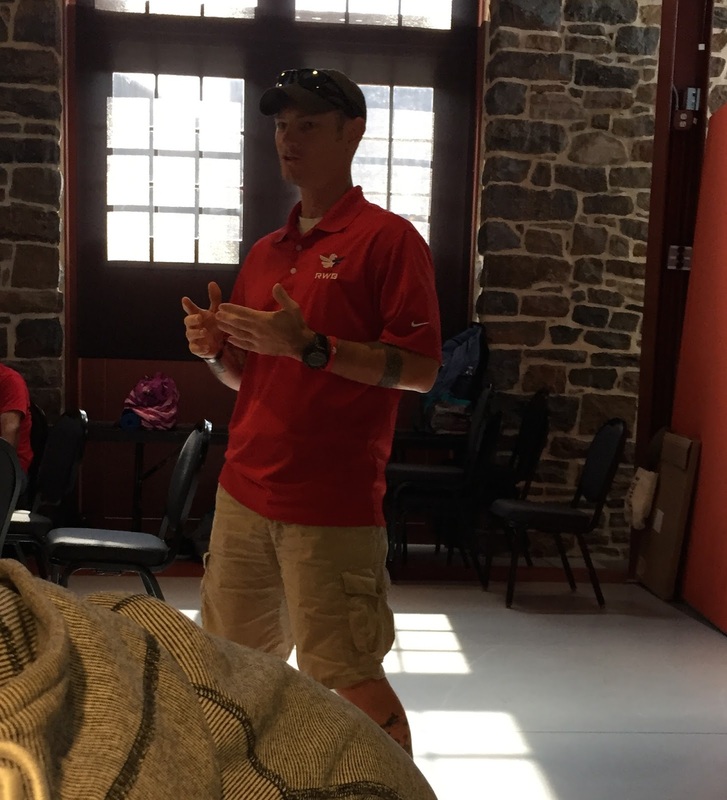 After lunch was a session that I was really excited for--a talk by Sean MacMillen, an Army veteran who used running to save his life, basically. He spent three years in Afghanistan, and became an alcoholic. When he returned to the states, he had such a hard time adjusting to "civilian" life, and he just drank even more. He had PTSD, and he suppressed his feelings with alcohol. He wound up in jail from five DUI's, and he even attempted suicide by overdosing on Tylenol, which put him in the hospital for a month. Eventually, it was running that saved his life. He stopped drinking, and started running. You can read more about his story here. After his talk, I went up to thank him for sharing his story, and ask him a couple of questions. I was curious about what family members of veterans can do to help them adjust to civilian life, but he didn't really have a definitive answer. He said that the family can do everything right, but the veteran really just has to want to change and live a positive life. He said that the best thing he could do for his recovery was to talk about his feelings and thoughts--instead of being a "badass" who didn't have any feelings, he started to open up and that was therapeutic for him. Because his story hit so close to home for me, I loved hearing what he had to say! He's going to be sharing his story tomorrow, also, to anyone who wants to come. So if you're doing the race, I highly recommend going to his seminar at noon tomorrow. Another of Bart's books, My Life on the Run (this one is for my brother), Running & Being by Dr. George Sheehan, RUN! 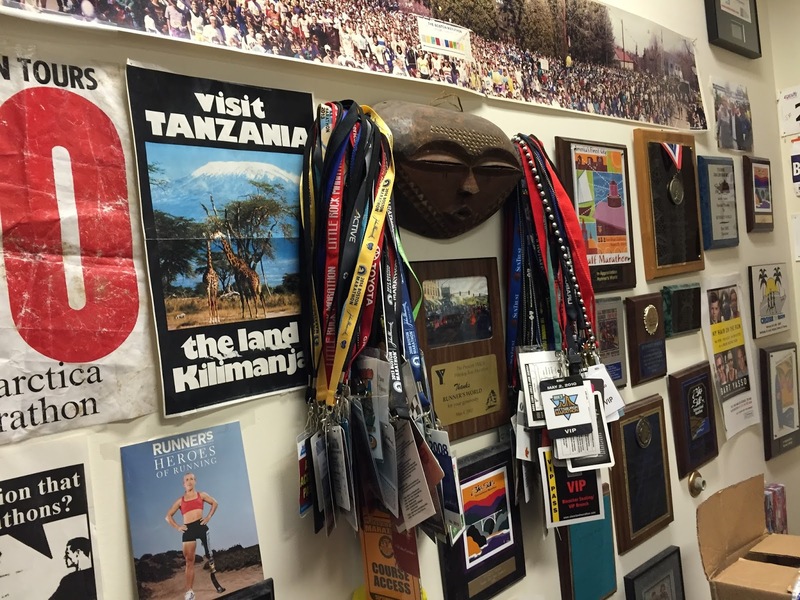 by Dean Karnazes, and a Runner's World t-shirt. I'm excited to read the books--I really loved Karnazes' book, Ultramarathon Man. After the expo, Charlene and I stayed to watch the kids' races. There were three--1/4 mile, 1/2 mile, and 1 mile. Seeing the little kids do the quarter mile race was SO adorable!! Bart Yasso himself keeps them on course by leading with a bike. I have to say, Runner's World really does put on an AMAZING race weekend--and not just for the bloggers. The announcer (I believe his name is Will, and I wish I could find his last name) was absolutely fantastic with those kids! He did everything he could to make them feel special--each and every one who crossed the finish line. I didn't have any kids running the races, but I still cried watching, haha. Isn't that an awesome backdrop for a race?! After the races, Charlene and I headed back to the hotel. We stopped for dinner at a little Italian place, where I had a piece of bruschetta pizza--it was delicious. Now it's time to hit the hay because I have two races to run tomorrow! What is it about race expos? I bought way more than I should have at the Detroit expo today! I hope you have a lot of fun at your races tomorrow! How fun! Good luck tomorrow! I would highly recommend trying Yin Yoga if you aren't a fan of the typical yoga classes where they do a lot of flows, which admittedly I don't care for. In Yin you hold each pose for 3-5 minutes and they are typically focused on the hip/leg areas. It's not difficult at all, unless you are a person who hates sitting still. I had crippling foot pain until I started doing it, and within 2 sessions my pain was almost gone. I also find I sleep really well on the days I do it, and it's done wonders for my flexibility. From a runner's standpoint I highly recommend it. Good luck this weekend! Thank you so much for sharing your experiences at the expo/festival. It makes me feel like I'm having an adventure right along with you even though I'm at home! Fit Bottomed Girls is my absolute favorite running site- they are incredibly positive for athletes at any level. How cool that you got to meet them! 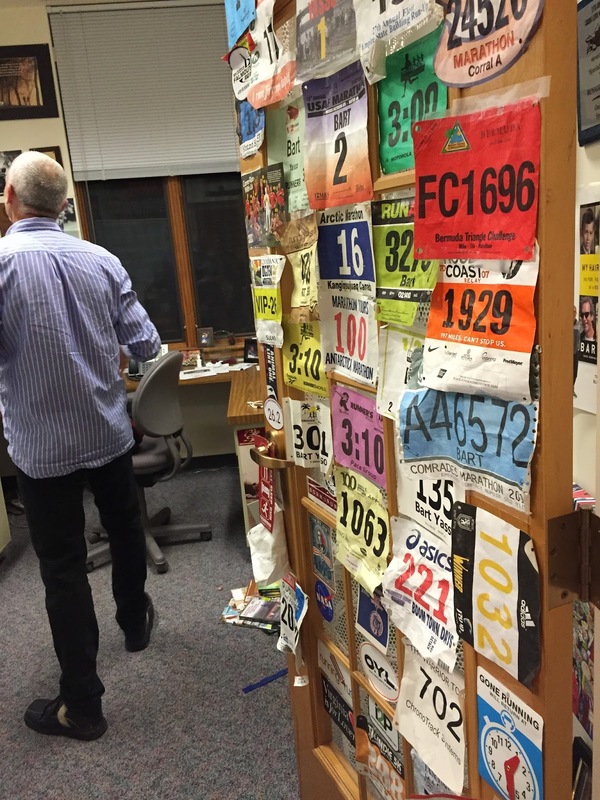 Wow, that sounds so cool to be in the mist of Runner's World! I am so jealous. You are going to love Dean Karnazes' book!!! He is my personal inspiration. I personally LOVE yoga. I find it fixes all the stress I put on my running legs. Give it another try if you can!!!! Great post.